No discussion of Americana in 2013 is complete without including this excellent effort from Whitmore. As many have pointed out, 2013 has been a pretty good year for young female country artists. Kacey Musgraves, Holly Williams (granddaughter of Hank Williams), Ashley Monroe, and Caitlyn Rose are just a few of the musicians who have released strong albums this year. Another newcomer, Brandy Clark, who co-wrote a song with Musgraves, has her own highly-anticipated record coming soon. If there's one name that needs to be added to that list, though, it's Bonnie Whitmore. Whitmore is the sister of Eleanor Whitmore, who forms half of husband/wife duo the Mastersons, whose Birds Fly South album was one of 2012's best Americana efforts. Eleanor and husband Chris Masterson offer Bonnie plenty of help on There I Go Again, supplying everything from backing vocals to guitars, violins, pedal steel, and more. 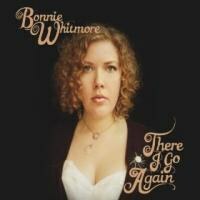 Both Eleanor Whitmore and Masterson are experienced hired hands, having worked with acts like Son Volt, Kelly Willis, and Steve Earle, but there's a real sense of musical sympathy when they team up with Bonnie. For all that family chemistry, though, this is firmly Bonnie Whitmore's record. She's a take-no-prisoners kind of singer -- think of clear-voiced artists like Tift Merritt or Aimee Mann -- who can cover a lot of vocal ground (she often performs with Hayes Carll, providing raucous counterpoint on his drunken hook-up duet "Another Like You"). With There I Go Again, she also shows an evolution from the Americana sound that defined her previous release, 2011's promising and enjoyable Embers to Ashes. Here, she's moved beyond a strict Americana sound and taken on more pop leanings. That's pop that keeps its twang and growl, though, in a way that's reminiscent of Tom Petty. Perhaps most impressive about Whitmore's songwriting -- and singing -- is her unique way of going from a no-nonsense kiss-off with bite like "Heartbreaker" ("You ain't nothing but a heartbreaker / You ain't nothing but a reason to cry") to a tender love song. Lots of singers can do that, of course, but the imagery in a song like "Colored Kisses" is especially noteworthy when Whitmore sings lyrics like "Hold us under the water colors / We can tangle each other in these sheets / I will stencil you with my fingers / You can color me in your kisses." Later, she brings it home with "let's try living and breathing / as a new form of healing / I will sing in mermaid tones / but please don't turn me to sea foam." This is the same songwriter who left at least two men dead on Embers to Ashes. In the end, Whitmore might chafe at being lumped in with the latest group of Nashville starlets, or of even being labelled "country". Even having just turned 30, she's been playing music and performing for nearly as long as some members of the new crop have has been alive. The hope that many listeners lay on that group, though, are that they'll finally return some small part of Nashville away from the booming country-rock machine it's become and stake out a claim for songwriting and personal artistic visions again. In that sense, Whitmore very much belongs in the company of any group whose members aren't afraid of being accessible, as long as it allows them to stay on their own paths. To this listener, Whitmore is very much part of a groundswell of talent that shows no signs of letting up, who should be penning insightful tales of life -- and singing them well -- for years to come.